A good marketing strategy is a must. Craft a winning marketing plan to focus your efforts, implement your ideas, and track your results. Expert advice is built into Sales and Marketing Pro, to guide you through crafting your plans and putting your campaigns into motion. Great marketing is more than ideas—it&apos;s about getting the right message in front of the right people at the right time. And, it&apos;s easier than you think. Track your key accounts, figure out how to turn leads into customers, and even forecast your commissions with professional sales planning and management tools. Sales forecasting and budgeting doesn&apos;t have to be a chore. With great sales and marketing plan software, it&apos;s easy to create projections and budgets and track your performance. Sometimes you have to “sell” your plan to your team. With Sales and Marketing Pro, you&apos;ll create impressive presentations that will win their support. Why Sales and Marketing Pro? 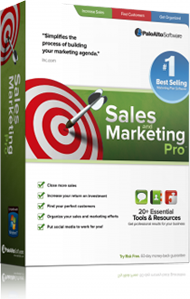 *Marketing Plan Pro is included in Sales and Marketing Pro.